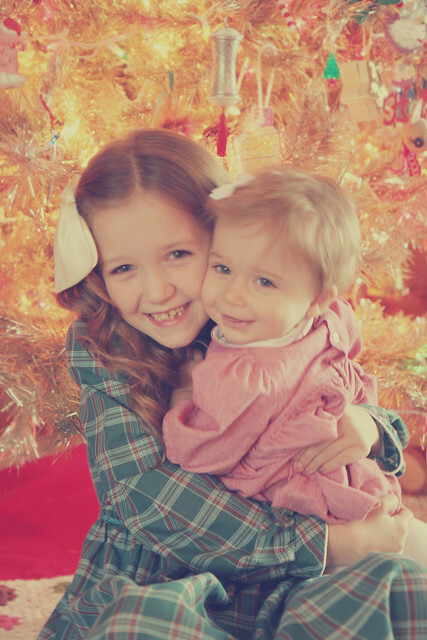 Your girls are so lovely :) Merry Almost Christmas! how lovely!! those happy faces made my day :) thanks for sharing! Everything is just perfect. And the girls look so happy. What a lucky mama. 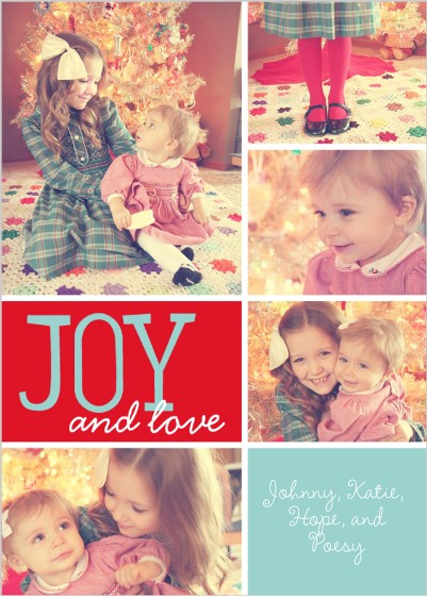 Such adorable kids and cute card! Beautiful photos! 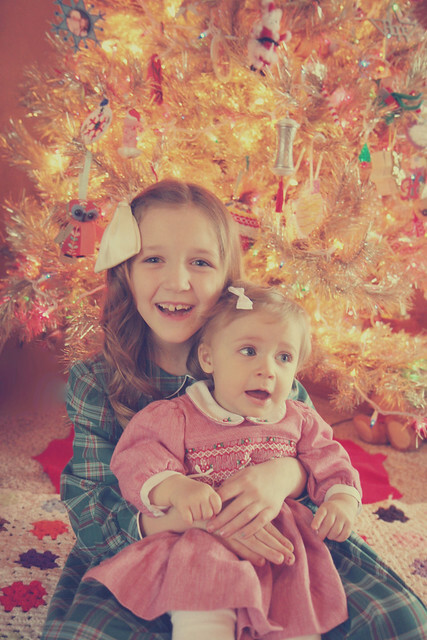 Your girls are so pretty :) I wish you all a very merry Christmas! 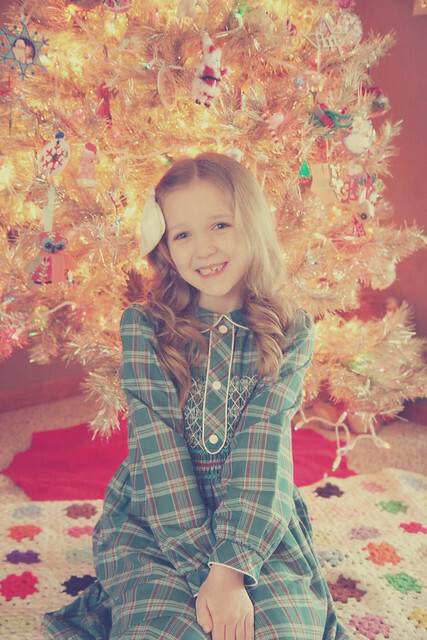 These pictures are so cute! I love Hope's dress. I'm sure they made cute Christmas cards! P.s. Super excited about the giveaway! Hope + Poesy are just dolls!! Perfect! These just turned out amazing and their outfits are just precious! They are so adorable! Beautiful photos! no, seriously 11 months??? it seems like u just had her! these pics are precious! i loooove their dresses. happy holidays! P.p.s. my email address is missmandyq@gmail.com since I'm such a spaz I forgot to include it... Sorry! Your kids are all kinds of adorable! PS. I love that blanket,too. Did you make it or buy it? Your girls are soo sweet! 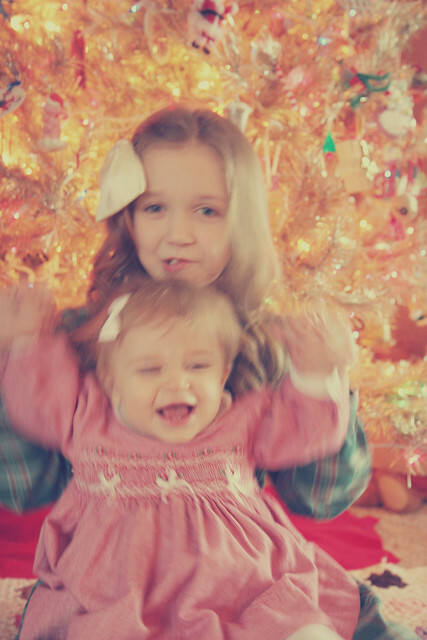 Love their dresses and how patient Hope is with Posey! lol adorable. real life is fun. those photos are beautifull, i love the colours of them! My goodness they're perfect! How cute! Thanks for sharing your beautiful card/pictures :). I'm behind on Christmas too. We didn't do cards last year and this year I decided to embroider family portrait ornaments... yeah, I'm like that. I decide a huge project is the best idea right before a big event/holiday, never mind the fact that I have a full time office job, a husband, and two girls. I've made 2 halves and am switching to painted portraits, and I haven't blogged at all this month about what I'm working on... We can do it! Happy Holidays! awwwwwww. these are so cute! Love the set-ups and all! Gorgeous photos! I love this holiday card! Also, your kids are totally adorbz! 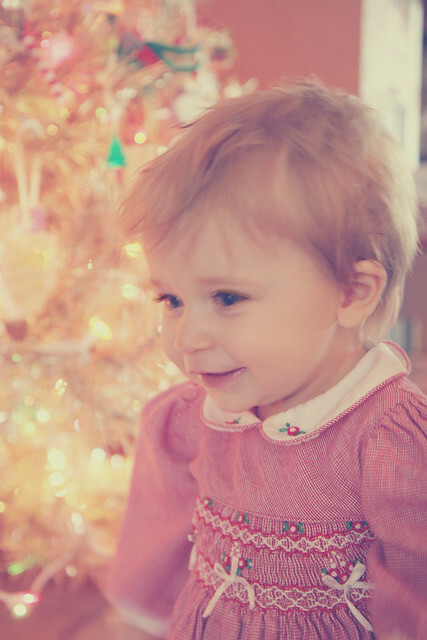 This is by far the cutest, prettiest Christmas card I've ever seen! 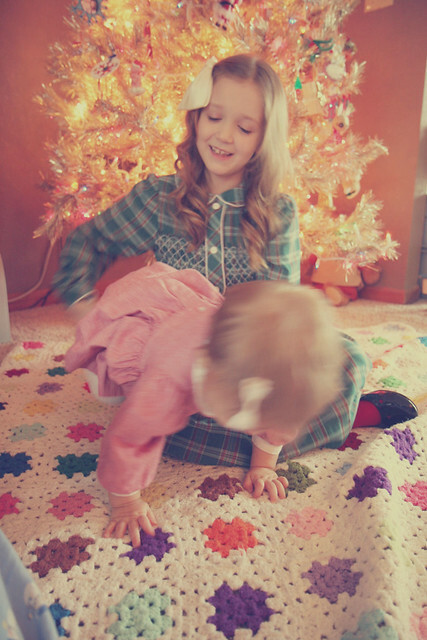 Your girls are so adorable, I love their little dresses! I love the big bow, little bow! These photos are so sweet and vintage looking. I love that Poe sings along with Hope. 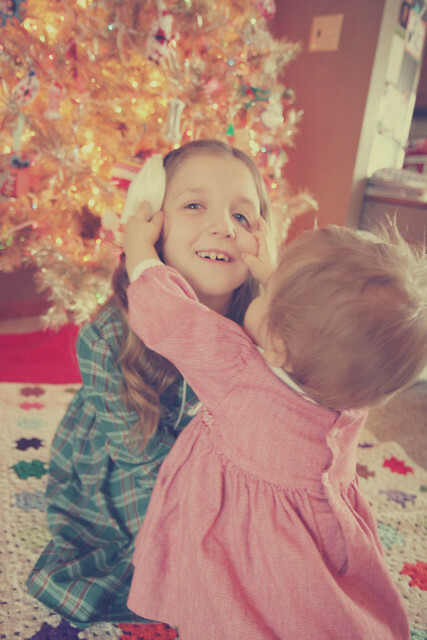 I'm pretty sure they are the cutest sisters around! you have the sweetest gals! i love all of these! SO CUTE. even the eye ripping one. you have a beautiful family! This is just too much cuteness in one post! I love the cards! Your babies are just too cute! So cute!!! :D I follow you! What a wonderfully adorable card. So precious. 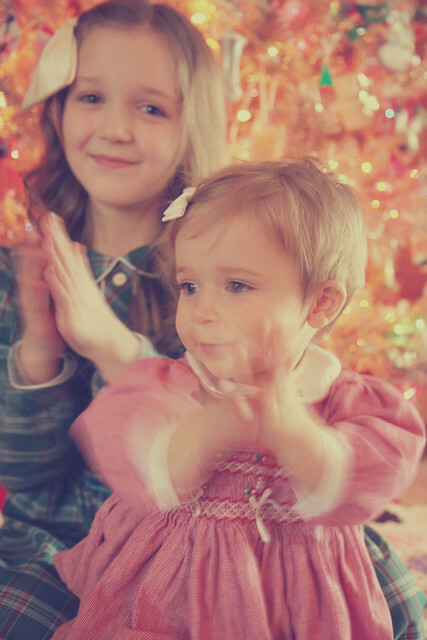 Posey is so cute and Hope looks like she's an amazing big sister. OMG. I am dying over here... like, seriously so much cuteness i'm about to explode! such a great job! 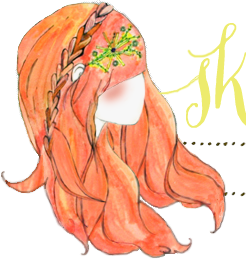 Oh What a Beautiful Post & Whimsical Blog - The prettiness made me dizzy! this post is so sweet! your family is adorable! OMG! Poesy is SO CUTE!! So lovely picture cards with best background selection.